The Nightmare Before Christmas is an iconic Halloween (Christmas) classic. 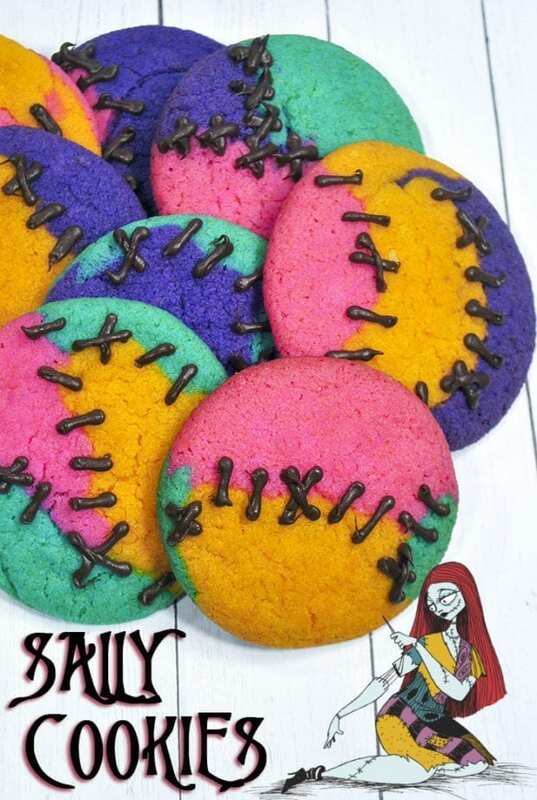 Sally is one of my favorite characters so I'm so excited to share these adorable Sally cookies with you. I'm always looking for fun Nightmare Before Christmas recipes that are easy for the kids to make. The cookies are made to look like Sally's patchwork dress and stitching. 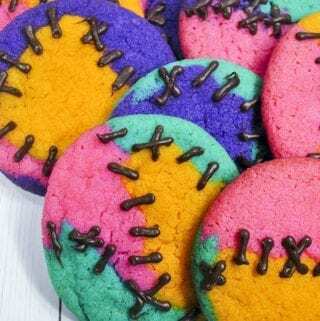 My kids love to bake and these cookies are super easy to make and decorate. 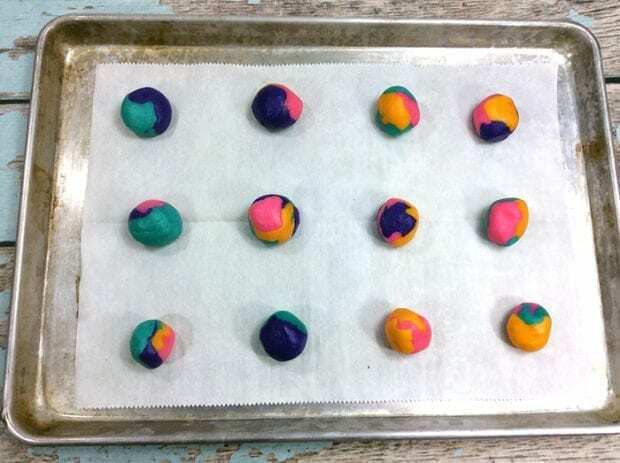 After you make your sugar cookie dough, divide it into four parts and color the dough, teal, purple, orange, and pink. Chill your dough for half an hour before forming the cookies to look like Sally. This ensures that the dough doesn't “bleed” or marble together and looks more like the patches on Sally's dress. 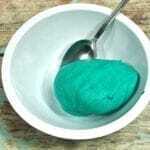 Pinch 2-3 colors together and roll them into a ball. 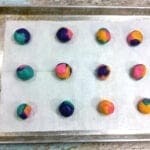 You don't want to roll them too much, you want the colors to stay separated in the ball. After you bake the cookies, let them cool completely before piping on the icing for her stitches. Make sure you follow the lines where the colors meet. A delicious Nightmare Before Christmas recipe that is easy to make and look like Sally. 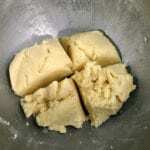 In a large bowl add the butter and sugar. Beat with an electric mixer on medium-high speed. 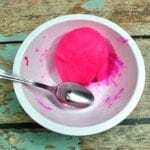 Beat until very pale and fluffy (about 3 to 5 minutes). Add the egg, and beat until well combined. Add in the egg yolk and vanilla extract beat until combined. Add the flour, cornstarch, baking soda, and salt. Beat on low until well combined. Bake the cookies 8-12 minutes. Melt a small handful of chocolate melts in a piping bag according to instructions on the bag. Snip the tip off the piping bag and use it to add stitches to the cookies. 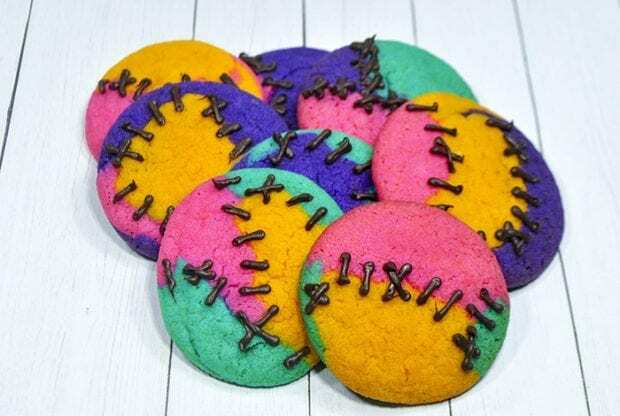 Follow the lines of different colors on the cookies. The stitches are so perfect to KNIT the cookie pieces together!! These are very beautiful, I want to try them!